When I go to the car mechanic I am lost and frustrated in their car mechanic lingo. Healthcare lingo is also a different language… our tools and procedures can be confusing, but it is your right to know and choose exactly what we are giving and doing to your body. You may not care exactly how each medication works, but you should understand the reasoning of what it is used for, and some of the most common side effects. Please don’t be under the assumption that you will be taking all of these! 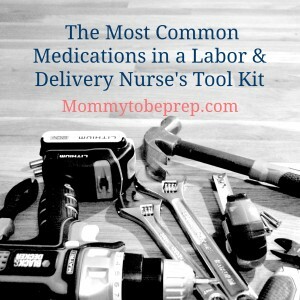 Most laboring women with routine, vaginal deliveries only have two to three of these medications at the most. This list is in alphabetical order for your convenience as it will be beneficial to have quick access to during your stay at the hospital! Prevention of operative infection (given prophylactically for c-sections). Side effects may include nausea and vomiting and diarrhea. Given as a shot to the pregnant mother in the muscle for the benefit of the baby. This steroid decreases Respiratory Distress Syndrome in preterm infants. Possible side effects include increased appetite, dizziness, nervousness, and edema (swelling in the extremities). This medication is placed vaginally used for an induction of labor, you may hear the nurse or doctor say it will “ripen” your cervix which basically means it will help your cervix dilate and efface easier (expect some discomfort). See post Cervical Dilation & Effacement with a Fruity Theme here. Possible side effects include headache, nausea and vomiting, and low blood pressure. Stool softener-Prevention of constipation (Your best friend if you have had a significant vaginal tear or c-section). Side effects may include diarrhea and mild cramps. Comes as a little red/orange pill, most nurses will offer this but you can always ask! Stops heavy bleeding after birth due to the uterus not tightening, given as a shot in the muscle. Side effects include diarrhea, nausea and vomiting, chills, and muscle cramps. Treats severely high blood pressure. Side effects include low blood pressure and an increased heart rate. Offered to pregnant or postpartum mothers during flu season. Protects mothers against three or four viruses that are likely to cause disease that year. Possible side effects include soreness or swelling where the shot was given, cough, fever, body aches, headache, itching and fatigue. Also treats severe high blood pressure. Side effects include low blood pressure and low heart rate. Prevents seizures in the patient with high blood pressure. Also given to mothers at risk for premature delivery to provide neuro protection to preterm infants. Side effects include drowsiness, feeling flushing, thirsty, headache, and low blood pressure. Stops heavy bleeding after birth. Side effects include abnormal heart rate, dizziness, headache, sweating, and a foul taste in the mouth. Through blood work it is determined if the mother is immune to rubella or non-immune. If the mother in non-immune the MMR vaccine is offered before discharge home. This vaccine protects the mother from all three of the diseases and is heavily encouraged to protect her as well as the new infant. Mild side effects include a fever, mild rash, or swelling of the glands in the cheeks or neck. Postpartum pain relief (works especially for the cramps). Side effects include an upset stomach, nausea and vomiting. *Please do not take this drugs during pregnancy as it can result in birth defects. Pain relief, can also help with itching after a c-section. Side effects include sleepiness, dizziness, upset stomach, nausea and vomiting, and constipation. Given to the laboring woman to prevent GBS in the newborn. Also treats other infections. Side effects include burning/irritation in the vein being infused in, nausea, vomiting, and diarrhea. A perfect mix of oxycodone and acetaminophen (Tylenol)! Used for postpartum pain relief. Side effects include drowsiness, dizziness, nausea, vomiting, and constipation, try to drink lots of fluid and walk frequently with this, you may also ask for a stool softener such as Colace. Nausea and vomiting relief. Side effects include drowsiness, dizziness, and a dry mouth. Induces labor (starts contractions) or augments labor (makes contractions stronger). Side effects include nausea and vomiting, headache, excessive uterine contractions, and abnormal fetal heart rate patterns. Given to a mother with negative blood type during pregnancy at 28 weeks by an intramuscular shot and possibly within 72 hours after delivery either intramuscularly or intravenously if the infant has a positive blood type. Rhogam prevents the mother from developing antibodies against the baby’s blood and hurting the baby (hemolytic disease of the newborn/erythroblastosis fetalis). Some side effects may include discomfort at the injection site, and slight elevation in temperature. Pain relief. Side effects may include headache, upset stomach, nausea, vomiting, and diarrhea. Pain relief. Most common side effects include headache, upset stomach, and diarrhea. In October 2012 The Advisory Committee on Immunization Practices (ACIP) decided that the Tdap vaccine should be encouraged during each pregnancy no matter the patient’s prior history of receiving the vaccine. The vaccine during pregnancy can actually transfer to the baby to protect baby especially from pertussis (the whooping cough). Optimal timing for the vaccine is between 27 and 36 weeks of gestation. This vaccine also prevents against diphtheria and tetanus. Most common side effects include swelling, pain, and tenderness at the injection site, body-ache, fatigue, or fever. Treatment of infection. Side effects may include nausea, vomiting, diarrhea, skin rash, and ringing in the ears. Nausea and vomiting relief. Side effects may include headache dizziness, constipation and diarrhea. Centers for Disease Control and Prevention. (2014). Influenza Vaccine Information Statement. Centers for Disease Control and Prevention. (2013). MMR Vaccine Information Statement. Centers for Disease Control and Prevention. (2014). Tdap for Pregnant Women: Information for Providers. Chippenham Labor & Delivery. (2013). 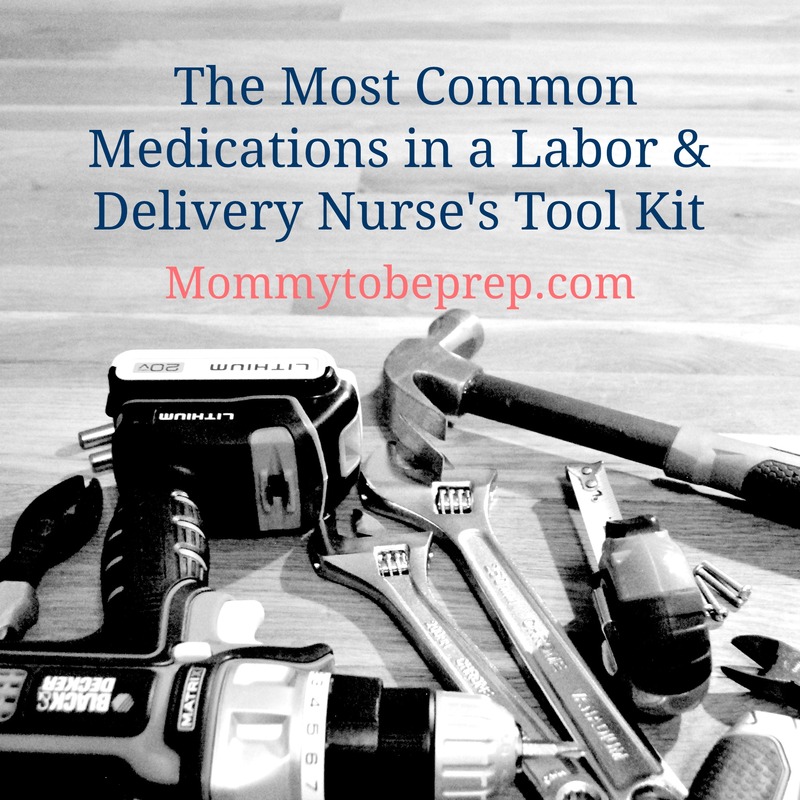 Labor & Delivery Medication Education Sheet. Deglin, J. H., & Vallerand, A. H. (2009). Davis’s Drug Guide for Nurses Eleventh edition. Philadelphia, PA: F. A. Davis Company. Hi my name is Janette and I just wanted to drop you a quick note here! I printed this out and put it in my hospital bag for delivery day! GREAT IDEA! I felt knowledgable and felt more involved in my care. I also was able to ask for medications they hadn’t even offered to me… “If you don’t know your options you don’t have any!” Thank you! I am SO happy to hear that! Good for you and congratulations! I have heard about the option of “laughing gas” as pain control in L&D, is that an actual thing? Yes that is an actual thing that has been utilized in Europe and is now starting to make it’s way to some states in the U.S! Check with your provider if any hospitals in your area offer this!